Not only do we have the best ideas for corporate gifts this year, but we can also put any name on it! 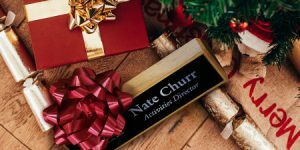 Scott Ginsberg has come up with a philosophy about personal identification, “Everyone should wear name tags, all the time, everywhere, forever.” And we don’t think he’s too far off, especially when it comes to corporate gifts. But, do you need a professional to tell you how essential name tags are? And, what about translating that into corporate gifts. Yes, it is that time of year again when every business should consider what they are giving to their employees, colleagues and customers. Providing corporate gifts is an opportunity to connect with your clients, strengthen employee ties and share your holiday cheer. Recruiting, retention and business development are three great reasons to give a gift. But don’t just give a gift because you think someone expects it. Give because you want to maintain these relationships. And, here are our three favorite gifts! These fancy name plates are perfect for showing just how much you appreciate someone. They also make an excellent award for any achievement. With a class of excellence above any other, these beautiful executive desk wedges are sure to show how much you care. Whether you give one for your corporate gifts or buy one for yourself, the professional quality reflects the excellence you demand from yourself and your company. 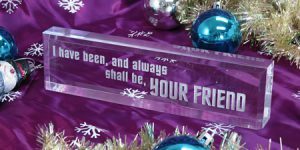 Crystalline acrylic desk blocks make beautiful corporate gifts for your colleagues or clients. The clear, inch-thick name blocks come with an optional black backing that makes the engraved text stand out. Select whether the text is laser engraved on the front or the back. Front engraving may include white, gold or silver colored filling. With lots of font options, customize one or two lines of text however you want. 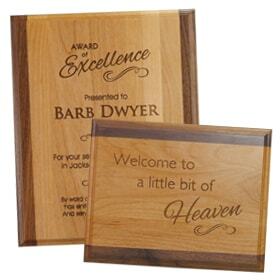 Give the gift of wood with award plaques. They are made of quality materials and have natural grain patterns. Each plaque is made from high-quality wood and comes with unique designs. And, these custom plaques come in many different colors and finishes from which to choose. With the same custom options for each plaque type, there is no limit to how you can put this award to good use. And, remember to wrap up these treasured corporate gifts in some custom (and branded) ribbon. Wrap ribbon rolls around an award plaque or use a rosette ribbon as a unique way of presenting a desk wedge. But, no matter your personalized ribbon choice, your colleagues are sure to love your corporate gifts this year. Whether you want a logo or text only, we have the perfect name plate for you! From Classic Name Plates to Executive Desk Wedges, sometimes it’s hard to come up with the perfect solutions for your identification needs. So, here is a brief product guide to help you make your decision on which name plate is best for you. Each of these choices will look splendid wherever you need them. Use them for names, titles and even directions in your office or retail establishment. These are also perfect for use in restaurants, hotels or other hospitality industries. Choose from plastic and metal with these name plates. Then choose your color and font. Lastly, decide if you need a logo or not. No matter where you are putting them, use a classic-looking name plate anywhere you want. 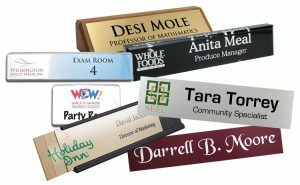 From a director’s office door to a concierge desk, and whether it’s plastic or metal, these name plates will be a perfect addition to your office. Logos for each plastic name plate are either engraved, UV color printed or hot-stamped. A metal name plate will have an engraved logo. Both materials come in a variety of colors that will match perfectly with your office or store decor. There are also several wall mounts and desk holders available to match each name plate and its use. This name plate system is similar in style to classic metal name plates. They come with printable inserts and the option of a UV color printed logo. Reusable name plates are a cost-effective solution for high turnover and seasonal industries. 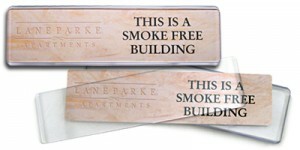 Do-it-yourself office name plates make it easy to change the information on your office signs. Simply print inserts as they are needed. Then, slide the insert into the existing holder behind the clear lens and you are done. Each name plate consists of four parts: a wall mount or desk holder, a metal backplate, the insert and a clear Lexan lens that protects the insert and holds everything in place. An optional UV color logo may be printed directly onto the metal backplate to help unify and brand all of the name plates in an office. Need a classier version than a reusable name plate? Try out this system instead. 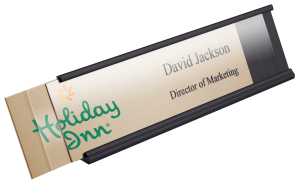 Made with durable plastic, and still available with printable inserts, these name plates come in three different sizes. Interchangeable attachments allow these plates to be used on desks, walls and cubicle partitions. Easily create custom paper inserts with any image, font or graphic. These durable name plates can last for years with proper care, gentle dusting and occasional spot cleaning. 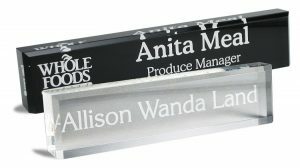 Quality Acrylic Desk Blocks make beautiful name plates, decorations and promotional tools. Add one or two lines of text for names, titles or even a quote. And, add a logo or a simple graphic to turn these blocks into corporate gifts for colleagues, clients and customers. These name plates don’t need a desk holder as they stand on their own. And, they come in two different colors, black and clear. Engraving comes on either the front or back with a choice to fill with either a silver or gold coloring to enhance the text and images. These name plates look great on a desk, bookshelf or anywhere else you would like to display them. Available in four styles, these desk wedges make the perfect gift. Add a personal touch to any workspace by displaying a name and a title. Or at home, use a desk wedge to decorate with loving expressions or quotes. Each name or message is laser engraved into a metal name plate and then attached to the surface of your chosen desk wedge. These make excellent corporate gifts. And this is one of the best ways to grow and maintain your business. 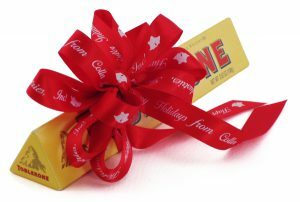 Most companies agree that the fundamental reason for corporate gifting is to acknowledge relationships and improve personal connections. But, no matter where you put them, make sure you choose what best suits your needs!